A hungry squirrel can eat all your bird seed within an hour. 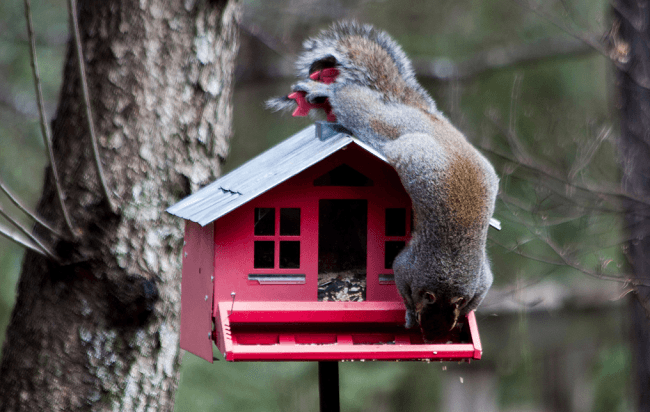 While some people will embrace the squirrel problem by offering squirrels their own special feeding platforms, others prefer the pesky little seed thieves go somewhere else to dine. The big question remains “How do I get the squirrels to stay away?” The answer lies in squirrel proof bird feeder pole baffle system. These innovative feeding systems are remarkable new technology. 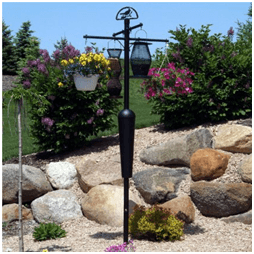 If your yard is already sporting a few bird feeders and purchasing a whole new feeding system seems unpractical, then buying a baffle cone or a torpedo pole baffle. Both are available as a way to adjust your own feeders to discourage hungry squirrels. When the critters become relentless, it becomes mandatory to take them on. A baffle placed over a bird feeder works well if the baffle is made of a solid metal material so the squirrels won’t chew through it. 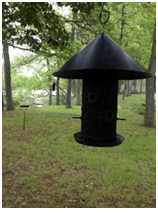 The Woodlink NABAF18 Audubon Wrap Around Squirrel Baffle, is an example of a versatile type baffle which will fit over most bird feeders easily. Just attach a coupler and the baffle will snap close and rest right on the feeder. The baffle may sit loosely on the coupler but this is okay because it will give the baffle an opportunity to sway, becoming a second deterrent when a squirrel touches it. This type of baffle will work on most feeders. If super squirrel comes nosing around, he will not be able to securely latch on to the feeder and slide off instead. This is the baffle to get due to its material and flexibility. You can also place this type baffle underneath the bottom of the feeder upside down to deter squirrrels this way, and to catch any loose seeds. Another way to use a baffle is to attach a torpedo style baffle to your feeder pole. These are inverted cone baffles with a spring action to move up and down and side to side as a way to dislodge squirrels from the pole. It becomes a frustrating task for the squirrels and they eventually give up trying to access the feeder via the pole. There is other bird feeders available designed to combat a squirrel problem. However, these products are typically either feeders which stick on window glass or come without a baffle system. 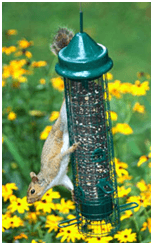 Audubon Bird's Delight Squirrel Resistant Bird Feeder Model 7511i is an example of a squirrel proof bird feeder which does not incorporate the traditional type baffle into the feeder. This model is more rustic looking, with a small baffle to catch loose seed. The attractive bird feeder works well to discourage pesky squirrels. Remember, squirrels are going to be around in almost any environment and will test their limits every time. If you don’t dislike them too much then consider adding them to your backyard menagerie by installing a special platform feeder only for them. They will stay close to their own feeders if offered their favorite treats like nuts and sunflower seeds. Squirrels are territorial, chasing off any new squirrels to arrive on the property. Although they can be a challenge when it comes to bird feeders, yet they also can be exhilarating to watch as they cleverly engage in trapeze tactics and jester acts. Nature’s entertainment doesn’t get better than this.